How can you possibly reach your sales numbers if you really don't know your ratios? This Mr. Cold Call Sales Tracking Sheet� can be used to automatically calculate your sales ratios for 2010 and every single year thereafter! Research studies have shown that if you consistently track and set daily, weekly, monthly and yearly sales goals you will mega-boost your sales success to the power of 10! Our tracking sheet is so easy to use and takes just minutes a day to fill out. At the end of each sales day, all you need to do is enter your daily statistics such as the number of prospects calls, contacts, appointments set and sales closed and this tracking sheet will automatically calculate your daily, weekly, monthly, yearly sales ratios for 2010 and beyond! This tracking sheet is amazing and the results that you will achieve are endless! Scroll down to the bottom of this page and submit your secure online payment TODAY! The Mr. 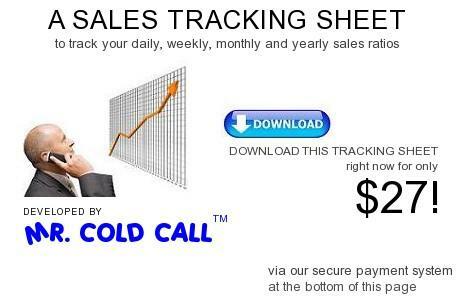 Cold Call Sales Tracking Sheet� is the #1 Sales Tracking Software for sales reps who make outbound prospecting calls! How many prospects do you need to call to make a contact? How many contacts do you need to speak with to set an appointment? How many calls do you need to make to set an appointment? How many contacts do you need to speak with to close a sale? How many appointments do you need to set to close a sale? How many samples do you need to send to close a sale? How many emails do you need to send to close a sale? How many requested faxes do you need to send to close a sale? How many dollars are you generating per sale? Click here for "The Most Frequently Asked Questions!" Double, Triple or even Quadruple your Income! Empower yourself and your sales with this just unbelievable Mr. Cold Call Sales Tracking Sheet�. Imagine having a sales ratio calculator at your fingertips that automatically calculates your sales ratios for 2010 and beyond? This sales tracking sheet can be used by outside sales reps, inside sales reps or by Sales Managers who want to instantly track their sales team performance! The Mr. Cold Call Sales Tracking Sheet� is your #1 sales tracking software program to use to track your prospect calls, contacts, appointments set and sales ratios! At the end of your sales day, insert your daily statistics and then your sales tracking sheet will automatically calculate your daily, weekly, monthly and even yearly sales ratios for the entire 2010 and every single year thereafter! Use this sales tracking sheet and never worry again about reaching your sales quota. Start working smarter and stop working harder! Submit your secure online payment and download this sales tracking sheet within minutes. Order this sales tracking sheet TODAY and take the guess work out of your sales success! After submitting your payment make sure that you click on the orange button (see example) to immediately receive directions on how to download your tracking sheet. We accept all major credit and debit cards including American Express, Discover, Mastercard and Visa via our secure servers through Paypal.com. Paypal is owned and operated by Ebay and has quickly become a global leader in secure online payment solutions with over 164,000,000 account members worldwide. In order to submit your secure online payment through Paypal just click on the "Buy Now" button. You can either register for their service for FREE (takes less than 5 minutes) or simply submit your credit card payment without registering for Paypal. You do not pay any additional fees by using Paypal. There are no refunds accepted, however, credit may be applied towards current and future products or services provided by Mr. Cold Call Seminars (The Mr. Cold Call Toolbox and Mr. Cold Call's 1 to 1 Coaching Services are excluded for credit). After you submit your secure online payment, you will automatically receive Mr. Cold Call's Free Weekly Cold Calling and Sales Prospecting Newsletter and you may cancel these emails at anytime. Just click on "unsubscribe" at the top of the email newsletter or send an email to unsubscribe@mrcoldcall.com. This Mr. Cold Call Sales Tracking Sheet may not be resold for profit without written consent from Mr. Cold Call, Inc. Legal action will be taken to those parties who are found to be violating this portion of these terms and conditions. If you should have any additional questions feel free to call us anytime at 561-828-9294.